There is a cynical adage that a good reporter would never let the facts get in the way of a good story. In reality the facts very often actually make good copy – but they may tell a terribly sad story. Our politicians believe that the media are guilty of only reporting negative stories and not focusing on the positives. Needless to say, politicians should perhaps create positive stories, rather than to provide the media with ample material for a multitude of negative reports about corruption, crime and nepotism. Leaving politics aside – nowhere does factual reporting lead to more emotional responses and accusations of negative reporting, than in aviation accident reports. Two accidents on the same day. One claimed the lives of fifteen people, the other, five. The greater death toll warranted a few pictures and a few lines on TV and Radio and after two days was hardly mentioned any more. The five deaths resulted in a flood of media coverage for more than a week and pages of emotion on social media. What is the difference, you ask? 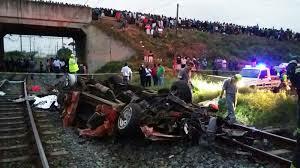 The fifteen people perished in a gruesome minibus taxi accident, the five in an aircraft crash. For those of us involved in aviation this extra public fascination with aircraft accidents remains an enigma. To me it proves again that, even in this modern age, we are still fascinated by flight – more so than by any other mode of travel. We have positioned airline travel as the safest form of transport available and our public have bought into this concept, not making the distinction between scheduled airline operations and any other general aviation flights. The major cause of a car/bus/truck accident is usually pretty obvious. The brakes had failed, the driver was drunk, a tire burst – the final link in the accident chain is easy to find. Somehow, we accept road accidents as par for the course – almost as if they are unavoidable. Any aircraft accident, however, leads to immediate speculation about what happened – we need to know why this happened, because we believe that it should not happen. This allows social media and the news media to have a field day – as I found out after a recent aircraft accident. 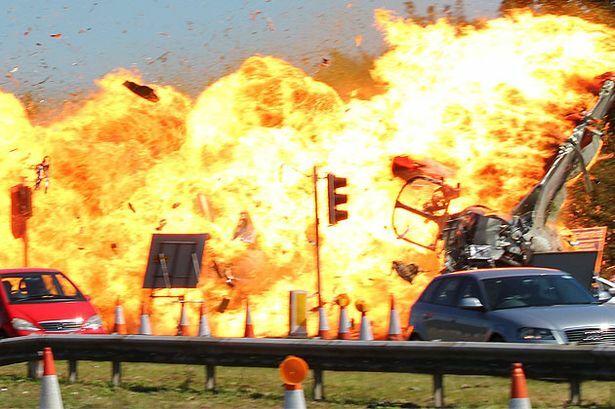 Within hours of my posting the information as I had received it from a very reliable source at the accident site, reporters were e-mailing and phoning me. One major news channel quoted my post verbatim and even posted a direct link to my Facebook CRM page. While I did not speculate, I did state in one instance that unconfirmed reports had indicated that the accident aircraft was in the process of flying a procedural approach, which may have gone wrong. The response to my post and media statements was, to say the least, very interesting. Some personal, rude and insulting responses were posted in reply to my post, as well as a number of more lucid posts, agreeing with my early assessment. The emotionally charged responses caught my attention – they conformed to the typical and expected reactions after an aircraft crash. After each and every aircraft crash one finds the immediate repudiation of those who might suggest that the pilot/s involved could potentially have made an error, followed by glowing testimonies about the experience, professionalism and skill of those pilot/s. However, ever since the 1979 NASA conference on Resource Management on the Flight Deck, we have known that human error is responsible for almost 70% of all aircraft accidents. Almost forty years later, that statistic unfortunately still stands. My whole involvement in CRM and Human Factors revolves around this reality and our attempts to avoid more smoking holes. First, Denial and Isolation – I don’t believe this is happening, I isolate myself from the reality, its not happening to me. Then, Anger – This is wrong, it shouldn’t happen, its someone’s fault. Next, Bargaining – Tell me its not true, maybe you missed something, if only we stopped them, if only the weather was better. This leads to Depression, which would require help to be overcome, and, finally – Acceptance. Those negative responses then represented the first two stages – Denial and Anger. One would have to work through the next stages to finally come to acceptance and understanding. Understanding that while it is human to want to speculate about the reasons for such a terrible crash, it should never become a blame game. The recent Hunter crash is another case in point. The public (via the media) immediately started looking for a scapegoat and the British CAA responded by ordering a review of airshow regulations, as well as grounding all Hawker Hunters (denial and anger). Somehow the media and public now feel vindicated – to what end though? With stringent airshow regulations already in place, the CAA may have no choice but to ban airshows over land! Hopefully reason will prevail in the end. I postulated at the start that politicians should rather create positive stories than to blame the media for negative coverage of their shenanigans. Perhaps we as pilots and aviation professionals should take heed as well. The positive stories of the many millions of safe flights conducted every day are easily overshadowed by one sad accident. Another safe flight about to land – no headlines. The answer is deceptively simple, albeit perhaps unattainable: Aircraft accidents make headline news – to avoid those headlines, we should avoid the accident. Random passengers or friends often pop into the cockpit while disembarking to chat (or criticise the landing…) The other night a cameraman with whom I had worked many years ago stopped to say hello and the conversation soon moved to our current occupations. He has moved on to operating camera drones and was quick to complain about the new CAA regulations, which now require drone operators to be licensed. In fact the SACAA was one of the first aviation regulators in the world to implement a set of regulations for the new drone phenomenon – which, in reality is not all that new. One of the Merriam-Webster’s definitions for drone is “an unmanned aircraft or ship guided by remote control or onboard computers” and, if you think about it, we have had remotely controlled aircraft for years. Many years later, my son (then in high school) would become involved in flying radio controlled models. These were much more sophisticated and operating the aircraft and radios now required SAAMA membership and adherence to all the applicable regulations. Some of these models, powered by huge engines, were so realistic that one could hardly discern them from real aircraft in flight. 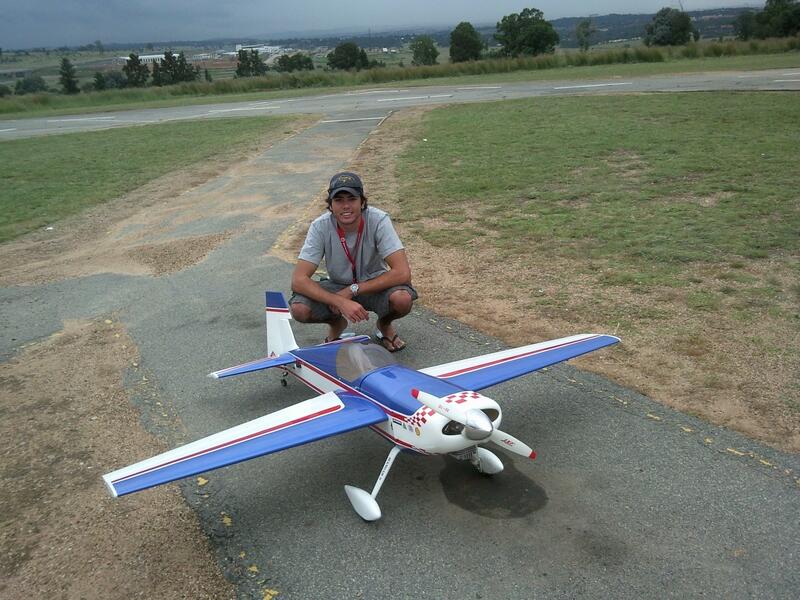 My son, Marc, a few years ago with one of his aircraft: An Extra 260 (the Patty Wagstaff model) with 50cc engine. Soon radio control helicopters were all the rage, capable of outrageous manoeuvres – simply impossible to do in real helicopters. The commercial application of these machines quickly became apparent and cameras were fitted, the new GoPro-type allowing all and sundry access to aerial video footage. One thing led to another and now every toy shop will sell you a quad-copter or multi-copter which you can immediately go and fly from your local park or beach. This has now become a thorny issue, with your average Chinese-made multi-copter, bought at the local toy store, suddenly being bracketed with huge commercial UAV’s or military strike drones. In fact, the definition is now simply “drone” – no more UAV. Are drones actually that dangerous? I would argue that our privacy is more at risk than our safety. These camera drones can be programmed to fly a predetermined GPS flight path without any direct control, while beaming video directly to the operator – who could be kilometres away. As always, the safety of the operation would depend on the operator’s skill, awareness and safety consciousness. Clearly, allowing your ten-year old to fly his drone on a busy beach would be dangerous, apart from being just plain stupid. In the USA someone recently operated a drone over a fire fighting operation, causing the grounding of the helicopters and aircraft – stupidity would be difficult to control. The popular media were quick off the mark to dramatise each and every reported incident of an aircraft experiencing a “near miss” by a drone. What we and the media should realise, is that the responsible use of these toys would hardly pose a threat to most aircraft operations – far less of a threat than bird strikes, of which we have plenty. Not all bird strikes end in dual flame-outs and river landings, but they occur very frequently and often cause substantial damage. 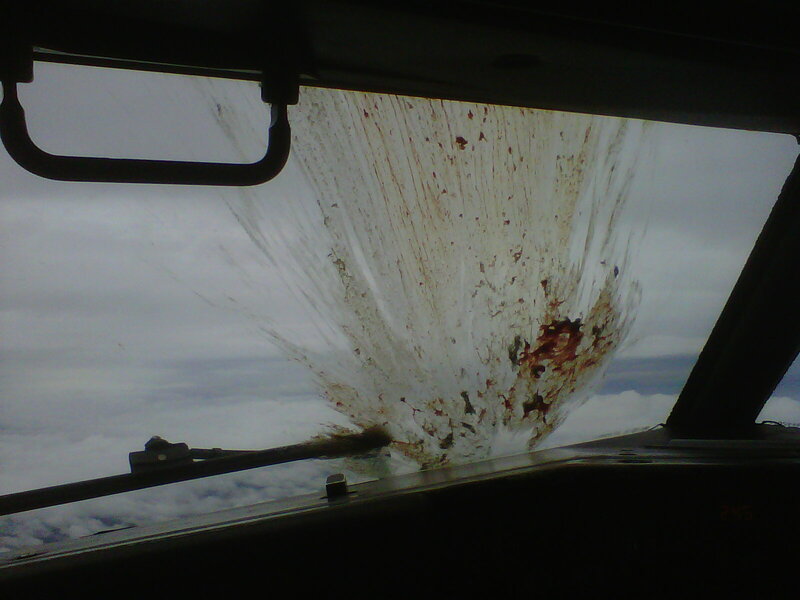 Bird strike! An Ibis (Hadeda) strike which had me involuntarily ducking on rotation. The remnants froze at altitude and accompanied us all the way to our destination. Some airports have measures in place to minimise the risk – at JNB they have the well known dog programme in place, other airports simply send out a vehicle to run up and down the runway when birds are reported. Despite the potential damage resulting from a bird strike, we accept that risk as manageable and keep on flying. All this while birds cannot be remotely controlled. Drone regulations need to address the airspace which could involve other aerial operations and aerial vehicles, or operation over sensitive populated areas. The answer regarding the use of drones would be some commonsense regulations and responsible operation of these potent machines by the many new converts to aviation. Fire Fighting – at What Cost? 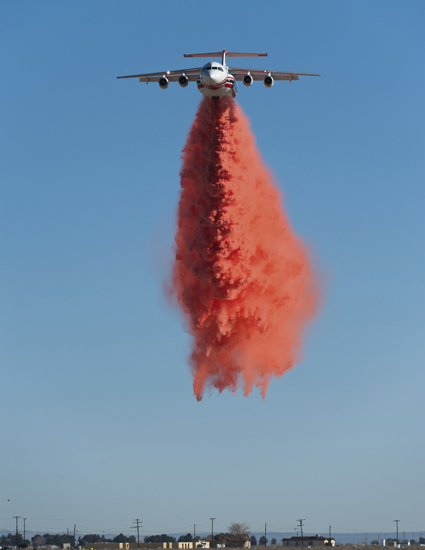 South Africans have seen some tumult in the airborne firefighting industry recently. A number of high-profile fatal accidents involving ageing Huey helicopters have drawn widespread criticism, with accusations of inadequate oversight by the SACAA and dodgy maintenance by the operators. 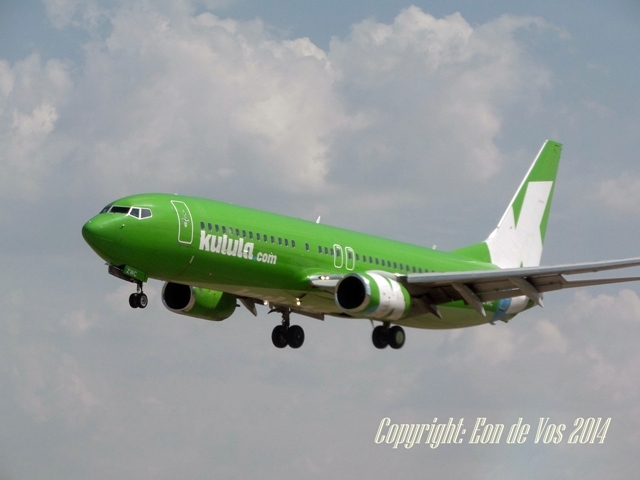 This culminated in the withdrawal of the WOF (Working on Fire) operating permits by the SACAA, with the usual recriminations now being bandied about by all parties involved. During the massive fires which devastated huge areas of the Cape Peninsula earlier this year, it became patently obvious that the Hueys with their Bambi Buckets were only managing to put out the fringes of these fires. The water bombers, single engine Ag-type aircraft, were wholly inadequate, having to ferry from distant airfields and back to refill their hoppers with water. Bigger aircraft with much more capacity were required. The ground forces of fire fighters were very effective, well-trained and would have been even more successful, had the aerial fire fighting been more effective. The answer, as always, lies in funding. The Hueys are old and cheap – running costs can be very high, but as the popular argument goes, one could well contain costs by cutting corners and using dubious spares. Perhaps we should take a leaf from the North American example. The US have long been leaders in aerial fire fighting, but even there the hard lessons learnt from using obsolete equipment have resulted in serious soul-searching and re-evaluation of aircraft. A number of fatal accidents involving Korean War vintage bombers have resulted in new aircraft being introduced, the BAE 146/Avro RJ being the prime example. With the Cape’s fire season only months away, it would have been ideal to have a few of these stationed around! The Malaysians have announced that more bits of debris have been found on Reunion’s shores – including, according to them, an aircraft window. The French investigators are being more cautious, not even confirming that the flaperon (found earlier) actually did come from MH370. It would appear however, that the evidence is pointing more and more to MH370 and that we could expect to see more debris washing ashore in the near future. Should this be the case, it at least puts the issue of what happened to the B777 to rest – it clearly ended up in the sea. What it does not explain at this stage is why it ended up somewhere in the southern Indian Ocean. What the current lack of evidence indicates is that someone deliberately interfered with the planned flight of MH370 and set it on a premeditated flight path, intentionally initiating this in the dead of night, at an inconspicuous ATC hand-over point and so avoiding detection – until it was too late. Who that interfering party was will haunt us for a while to come, unless the CVR (cockpit voice recorder) and the FDR (flight data recorder) are found. Even so, with such cunning evident in the event, I doubt whether the CVR would yield any evidence anyway: Following the emerging pattern of deceit, it was probably disabled before the interference took place – easy to do. One can only hope that the FDR would still contain some evidence which could point to where the interference came from and at what stage of the flight. Leaving aside all the speculation about how the aircraft hit the sea and why no debris have been found until now, the question for us as CRM practitioners will revolve around the role of the crew (both flight and cabin crew) in this mystery. The LAM suicidal pilot and the recent Germanwings disaster just added oil to the fire and we have already seen some knee-jerk reaction in the new reams of questions added to our annual medical examinations. Now our AME’s need to become psychologists as well – while we forget that when we consider the millions of safe flights undertaken daily, these tragedies could be regarded as almost negligible in the bigger scheme of things. There are many thousands of us still plying our trade as pilots daily, doing so with great care and responsibility. While MH370 will remain a mystery and be discussed on our flight decks, it has to my mind not changed the professional way my fellow pilots and I view our jobs at all.